There is a strange story about the wrecks of two Great Lakes boats operated by the Benton Harbor cult House of David. The House of David, once a powerful circle of people who worshipped a man who proclaimed himself God, is all but a forgotten memory now. But about a century ago, the cult was a prominent group that built its own private colony and did business with the outside world. The cult was known all over the world for its baseball team, band, art work and colony museum located at Benton Harbor. The men stood out because they did not shave and grew long flowing beards. The group’s leader, Ben Purnell, declared himself to be God. He was known as King Ben. Before he died, Purnell declared that he would rise from the dead to prove his claims to be a deity. When the man died his followers carefully preserved his body, kept it in a glass case in one of the buildings on the colony, and waited. He never returned. During its heyday, the House of David operated boats between Benton Harbor and High Island, a cult-owned property in Northern Lake Michigan. The steamship Rising Sun was lost when it went aground on Pyramid Point during a blinding snowstorm on Oct. 29, 1917. Four years later and almost to the day, the cult-owned schooner Rosa Belle capsized while carrying passengers and lumber back to Benton Harbor from the island. The overturned hull was found floating in the middle of the lake on Oct. 30, 1921. In both cases, the boats were making their final trips of the season, bringing cult members from the island, where they lived, to Benton Harbor to stay for the winter. The story of the Rosa Belle disaster was the more spectacular of the two wrecks because it has a mystery attached. Four crew members and seven passengers perished. Damage to the wreck indicated that the vessel had been in a collision, although that was never proven. The loss of the Rising Sun was considered serious enough when it happened. The wooden hulled vessel was a ripe 33-years-old when it got in the storm that destroyed it. 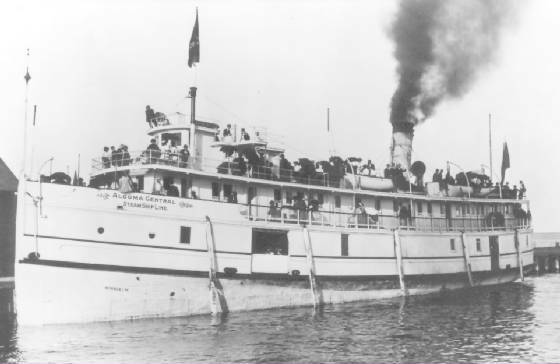 Originally named the Minnie M., the steamer operated under both US and Canadian registry before it was purchased by the House of David. The cult group changed its name in 1915. The ship was under the command of Capt. Charles Morrison of St. Joseph when it left the island with 18 people aboard. Packed in the hold were 3,000 bushels of potatoes and 40,000 feet of lumber, the fruit of the island worker’s summer labor. When caught in a blinding snowstorm, Capt. Morrison said he tried to reach safety at Charlevoix. The boat got in trouble when it struck a rock, lost its rudder, and drifted at the mercy of the storm. Before it struck the point the engine room flooded. Everybody miraculously escaped the wreck even though one of the two lifeboats capsized. The people clung to the overturned boat until they drifted to shore. One sailor, a man named Putnam, was accidentally left behind on the wreck. He was removed by lifesavers from Sleeping Bear Point, who came from seven miles away. The vessel was breaking up when lifesavers arrived.